Why did I read this? I have read all of the previous Cotton Malone books that Steve Berry has written. I enjoy the way he uses history to create a mystery today. What if a rogue member of a nation violently opposed to the United States was to get their hands on some information that would prove that the US government had perpetrated a fraud against their own people. The sixteenth amendment, income tax, was supposedly ratified in 1913, but that may not be the complete and accurate representation of what actually. A political opponent of FDR taunted him with some information that could have seriously damaged the USA, now that information has fallen into the hands of an enemy of another political leader and he wants to use it to put himself back in a position of power. Cotton Malone, another agent from the Magellan Billet and a Treasury Agent run all over the world seeking answers, turns out the answer is in the Smithsonian. Did I enjoy it? Yes, Steve Berry effectively melds a topic from the past that people still debate about and melds it with international intrigue. His combination of characters, action, politics and intrigue make this a real page turner. What is with the title of the review? If the 16th Amendment wasn’t actually ratified in 1913 the federal government would not have the authority to collect income tax and would owe everyone since 1913 their money back. Why did I read this? Because I like Steve Berry’s books and his style. Russia has decided to put a tsar back on the throne, but the process is corrupt and being manipulated by the Russian military, aristocracy, mafiya and an American lawyer. Into the mix is thrown young African American lawyer Miles Lord, who has been fascinated by the country since he was young and speaks fluent Russian. He discovers in the Archives that there may be some with a claim to the throne, other than the corrupt one his boss is pushing. He and his accomplice, a gymnast from the Russian circus, are chased all over Russia and then to an unexpected part of the United States seeking answers to the riddles left decades ago. Ultimately good wins out and those who attempted to manipulate the system are dealt with appropriately. Did I enjoy it? Yes, it was a good action story with a hero who had to rely on his wits, not on formerly being a Army ranger or special agent. What is with the title of the review? Miles Lord, a lawyer from Atlanta gets drawn into a international conspiracy and has to survive on his wits. He is not trained in any kind of combat or martial arts, he just goes with his instincts. Why did I pick this up? Because I like the way Steve Berry mixes history with modern day current events. Cotton, Cassiopeia, Stephanie Nell and many others get sucked into the internal politics of China as a transition of power is about to take place. At stake are the lives of friends of Cassiopeia and the future direction of the most populous nation in the world. Ranging from Copenhagen to Russia to all parts of China and involving intelligence agencies from the three most powerful countries on the planet. At the heart of the book is the question is oil a resource that can be exhausted or does the earth continually manufacture it. Did I enjoy it? Yes I like the Steve Berry mixes historical fact with fiction to make an exciting modern-day story with lots of action but firmly grounded in reality. What is with the title of the review? 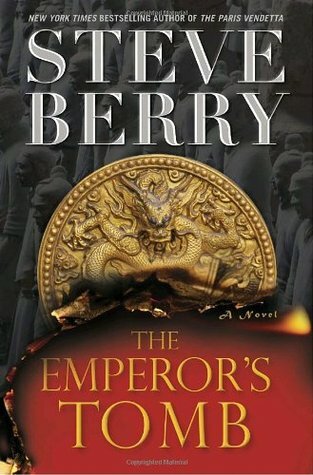 The action spans from ancient China to unrest in its recent past and into the future.